The latest edition of the Consumer Guide to Home Energy Savings reports that heating costs represent the largest residential energy expense—35 to 50 percent—of annual energy bills. Fortunately, homeowners have many fueland money-saving options superior to turning up the thermostat on an inefficient gasor oil-fueled furnace or boiler, using an electric space heater or throwing more logs into the old fireplace. Before buying any major home heating equipment, it makes sense to first fix leaks. Beef up insulation; seal places where heat typically escapes— around windows and doors, dryer vents and cable and phone lines—and make sure heating ducts and pipes are working properly. Good ventilation is also vital in an air-sealed home, both to control moisture and prevent build-up of indoor pollutants. Air-source heat pump: Because aboveground heat pumps transfer heat—from inside to outside or vice versa—rather than create it, like a conventional heating and air-conditioning unit, they can provide up to four times the amount of energy they consume, according to the U.S. Department of Energy (DOE). They also help dehumidify indoor air, reducing the need for air conditioning in warm months. Outdated furnaces and boilers are bad news for the environment, accounting for about 12 percent of U.S. sulfur dioxide and nitrogen oxide emissions. efficient as a typical furnace; even the excess, known as “super heat,” can be captured to heat household water. Estimated payback on a geothermal unit is two to 10 years. Solar heat: Solar heat is either active—capturing the sun’s heat by means of solar collectors—or passive—captured via a home feature such as a sunroom with a south-facing wall that vents warm air into the home. For an existing home, an appropriately designed shed or garage can be well suited for a solar collector; otherwise, a shade-free roof space is often the best option. An active solar-heating system can be airor water-based: the latter requires installation of a water storage tank, either in an insulated box outside or beside an existing indoor water tank. The DOE advises that the most economic designs use an active solar heating system to supply 40 to 80 percent of a home’s heating needs. By combining such a system with passive solar design features—such as thermal walls and tile floors—families may need very little supplemental heat other than solar. Wood stoves, pellet stoves and inserts: Traditional fireplaces look cozy, but they can send as much as 300 cubic feet per minute of a home’s precious heated air straight up the chimney. Woodstoves, meanwhile, have come a long way, environmentally speaking. Whether old-fashioned or modern in appearance, a contemporary woodstove can serve as an efficient space heater. The DOE considers pellet stoves the cleanest solid fuel-burning residential heating appliances; so efficient (78 to 85 percent) that the U.S. Environmental Protection Agency exempts them from smoke testing. Pellet stoves can be freestanding, or pellet stove inserts can be fitted to an existing fireplace. 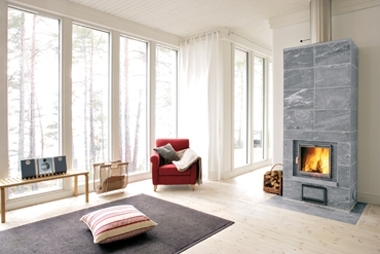 With airtight doors, temperature controls and easy loading and cleaning capabilities, fireplace inserts readily turn an energy-wasting fireplace into an efficient home-heating machine. Radiant heat: Radiated heat—distributed through a home’s floors, walls or ceiling panels, as opposed to baseboard panels, steam radiators or forced air systems—is efficient, doesn’t aggravate allergies and can complement a variety of heating systems, including gasor oil-powered boilers and solar water heaters if it’s a hydronic (liquid) model. With hydronic radiant floors, the most efficient and popular method, heated water flows from the boiler to specialized underlying tubing that is either embedded in concrete or seated between layers of subflooring. One downside: a radiant floor can’t be covered with carpet. But with all that toastiness underfoot, why would anyone want to? Brita Belli is the editor of E-The Environmental Magazine and author of The Complete Idiot’s Guide to Renewable Energy for Your Home.